The third promo single from Savoy's album "Reasons To Stay Indoors" was "Five Million Years". It was released to Norwegian radio stations at the end of February to coincide with the Norwegian Spellemann Awards. The cover of the promo shows a blurred picture of a man and woman embracing against an orange-red background. 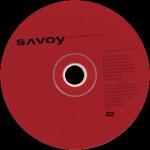 The title and Savoy logo are printed in black towards the top left hand side of the sleeve. The bottom half of the reverse of the sleeve is red with black text. Above is an abstract red / yellow / black photo at the top. On the back of the CD, there is a sticker with text announcing Savoy as nominees for the annual Spellemannspris awards, in the category 'Pop band of the year' - which they later also won. The disc itself is red with black text. The CD features an edit versiom of "Five Million Years" (4:06).